Make 2019 a Year of Resistance! Last year ended with weeks of mass protests across France against Macron's neoliberal reforms while students led a wave of mobilizations around the world to demand urgent climate action. The Extinction Rebellion is organizing a new generation of climate activists and the Vancouver Tenants' Union and the Coalition of Progressive Electors (COPE) won a victory at city hall, passing a ban on renovictions. 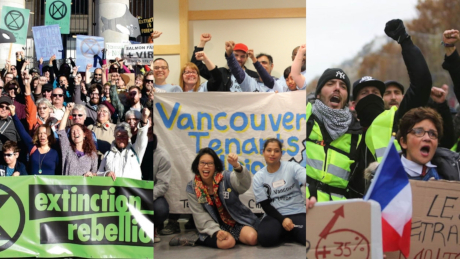 Join Amy Scaife of Extinction Rebellion, Sara Sagaii from the Vancouver Tenants' Union, and Josh Arlitt with the International Socialists to discuss how we can build on the key struggles and victories from last year to win the battles to come in 2019. This event takes place on the unceded territories of the Coast Salish Peoples; the Musqueam, Tseil-Waututh and Squamish nations, whom we thank and honour for taking care of this land from time immemorial.